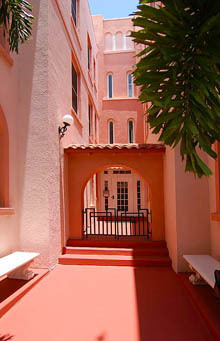 Patrons of the arts and history buffs looking for Sarasota Florida condos for sale will have a delightful find in the Frances Carlton at 1221 North Palm Avenue. Located in the downtown district close to the waterfront of Sarasota City, this property traces back to the roaring 1920s when the relatively prosperous years led to the influx of real estate investors in the Sunshine State. The condo units here can prove to be prized acquisition options that are filled with charm, charm, and more charm. 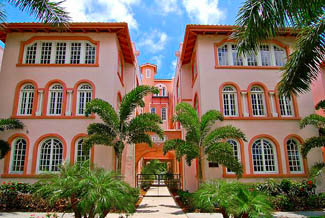 This historic Sarasota real estate development is composed of just twenty-one residences in a three-story structure of Spanish Mediterranean architecture that has matured gracefully along with the flourishing of arts and culture centers in its immediate neighborhood. The condominium building has been perfectly maintained and lovingly restored and while browsing the Frances Carlton condos for sale, it is easy to find a unit with its Palladian windows and original wooden floors intact but refinished along with other modern updates. Definitely quaint and charming, these residences have floor plans measuring between 650 square feet and 1,150 square. Typically, these units have one bedroom and one bathroom, and are sales-listed with tag prices from the mid-$200s up to the mid-$300s. A select 720-square-foot unit, nonetheless, can be offered just a bit below the mid $200s, which can be one gem of a find for its one bedroom, one bathroom, and a sun room. 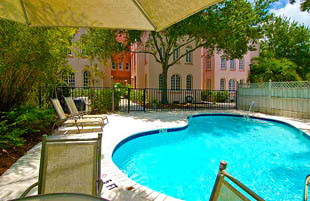 The old Florida charm of this community at once manifests in its fine tropical landscaping and wrought iron gates. There’s a swimming pool within the complex wherein the residents have the option to keep two large pets in their households. As there are just twenty-one residences in the condo, coupled with its one-year minimum rent policy, the Frances Carlton is a close-knit community where it is easy to build friendships. This amiable ambience rarely encountered in larger condos for sale in Sarasota is complemented by inspiring hubs of the arts near the condo. Such sources of cultural delights in Frances Carlton’s neighborhood include the Sarasota Opera House, the Golden Apple Dinner Theatre, and the Florida Studio Theater. Just as convenient, a refreshing stroll at the nearby Marina Jack’s Trail at Bayfront Park can easily segue to the fine restaurants in the area like the Café Epicure or listen to some live music at the Key West style O’Leary’s Tiki Bar and Grill. Also notably, shopping for necessities at the Whole Foods Market a few blocks from the community can also give you a convenient opportunity to visit the nearby Shelby Library. Sophisticated shops and boutiques are also located in the downtown district as well as at St. Armands Circle. This shopping destination is only a few minutes’ drive across the Ringling Bridge, a short trip that if extended a bit further west grants visitors accesses Lido Key and its exquisite beaches. Below are all of the current listings of available condos for sale at Frances Carlton.